Avery Dennison Monarch® printers zijn betrouwbare en efficiënte printers. TopLabel Printers levert Monarch printers van instap model tot hoog volume printers. 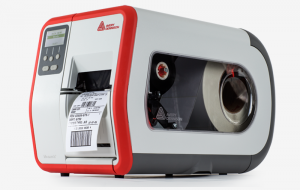 The Avery Dennison Monarch® FreshMarx® 9417+ Solution is designed for nutrition, ingredient, grab-and-go and date code labeling, inventory rotation, employee training and more. 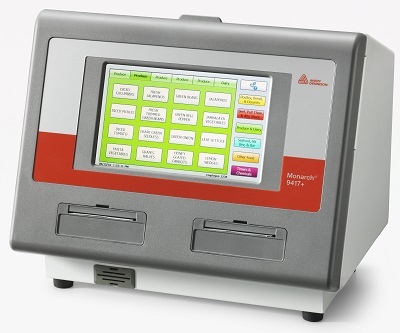 The 9417+ combines dual printers with intuitive FreshMarx software and a touchscreen interface to provide an all-in-one compact, robust solution designed for foodservice environments. The 9419 also has an integrated, user-positionable 3.5” color display – one of the largest display of any desktop printer on the market. Also included is the real-time clock and a label peel mechanism with present sensor as standard. Durable construction makes it a great choice for manufacturing and distribution center labeling applications. As soon as you remove the Avery Dennison Monarch® 9419 printer from its box and follow the easy setup instructions, you’ll be printing and labeling in no time! It comes pre-loaded with popular in-store label formats for price tags, shelf labels, and shipping labels, or just download your preferred formats from your host. 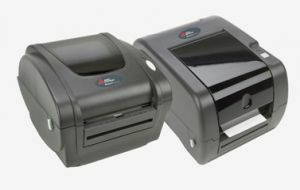 For standalone printing, simply add a keyboard or scanner. Whether your store has little or no IT support or you just want a faster way to implement price changes, the 9419 is the optimal solution with a powerful performance and a compact size. We’ve taken printing and encoding to the next level for you. 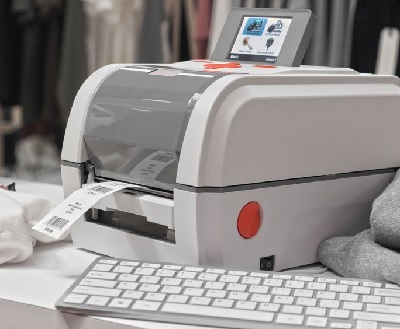 The Avery Dennison Tabletop Printer 1 (ADTP1) was designed to be the fastest, most productive RFID printer/encoder in its class. Our breakthrough technology enables you to not only accelerate your performance, but also work more efficiently and intelligently. We developed this dynamic and sleek tabletop to speed your barcode and RFID label and tag printing, encoding, verifying, cutting and stacking. To help ensure you don’t print a “bad” bar code, our “Fail-Safe Dot Shifting” feature automatically corrects for “bad dots”. “Gray Box Alert” helps eliminate unreadable bar codes by printing a gray box in place of an invalid bar code when dot shifting can’t fix the problem. The compact design of the 9906 ensures it fits into some of the tightest workspaces in distribution centers and retail stores. Its design and low-noise printing output avoid disruption to the retail customer experience. Energy Star rated, reducing your impact on the environment, saving on energy and costs. 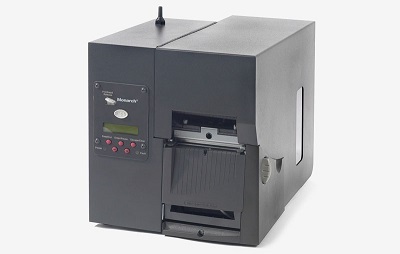 The Pathfinder 6032™ features a unique, one-piece design that combines a keyboard, label printer applicator, and key entry or optional scanner. 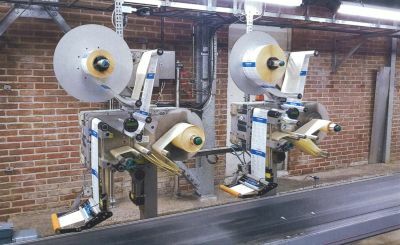 It’s perfect for retailers looking to increase productivity with an economical, portable solution that simplifies small-volume label applications. Why select the Pathfinder® 6032? Easy-to-use: Download label information, scan or key in product information, print label, and mark item. It’s that simple. Durable: Heavy-duty plastic and rubber over-molds protect printer if it’s ever dropped. Efficient: Labeling at the product refines process steps and saves time. Customer satisfaction: Associates spend more time helping shoppers not labeling. Pricing accuracy: Eliminate pricing mismatches at point of sale for improved customer confidence and retention. Skip the traditional manual “red pen” method and efficiently price and markdown items with the Avery Dennison® Monarch®Pathfinder® 6057 printer. It’s faster and easier to load with a smaller, lighter design that includes additional storage capacity. And, the Pathfinder 6057 enables distribution centers and manufacturers to quickly and accurately capture data, cross-dock, route, date code, and more to increase compliance and improve profitability. Improves markdown speed by more than 50% than manual marking methods. Eliminates error-prone, manual data-matching processes with advanced data collection, real time communication, and storage ability. Requires less time to perform labeling operations to ensure retail sales associates are available to customers. Provides consistency of pricing labels to protect and elevate brands, while helping to minimize fraud and shrinkage. 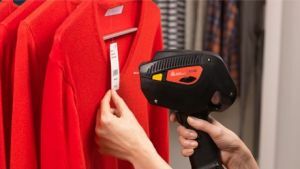 Outperforms two-piece printer and data collection solutions with barcode scanning, and label printing and application performed with one hand. Less integration and IT support needed. Prove the benefits of Avery Dennison’s Pathfinder 6057 handheld printing solution. There is little or no investment of time from your IT department, and we provide everything your team needs to get started. 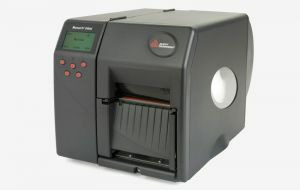 Powered Manhattan Associates' GlobalBay price application software, the 6140 printer enables scanning and integrated print and apply capabilities to perform markdown and promotional labeling with greater speed and accuracy than conventional redpen techniques. It's perfect for central tracking of pricing events and dashboard reporting capabilities to ensure accuracy and continuous improvement. 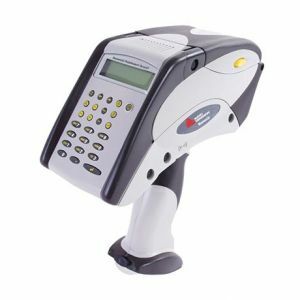 Quickly and accurately capture data, cross-dock, route, date code and perform compliance labeling, all of which can help reduce labor costs. 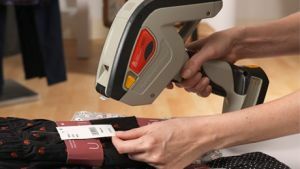 Because bar code scanning, labeling, printing and applying can be performed with just one hand, employees are able to spend less time handling items, increasing labeling speed and accuracy.